Tonight at 6:00pm the great Festival of Nine Lessons and Carols was held at All Saints; with a congregation of 450, 60 singers, 3 organists and the one solo boy, magically singing “Once in royal David’s city” (pictured left), this was a spectacle of word and music. The service included the European première of Dan Forrest’s Carol of Joy, the title track of our latest CD, which can be purchased on-line here. the monastic office in the Middle Ages, these antiphons, often called the “Greater” Antiphons or the “O” Antiphons, add a mood of eager expectation to the liturgy that builds throughout these seven days and climaxes at Christmas. The service concludes with the great plainsong Hymn, Alma redemptoris Mater. On Christmas Eve, Midnight Mass is sung by the choir of Girls and Men to the ‘Messe de minuit pour Noël’ by Charpentier, and begins at 11:15pm. This service is one of the busiest of the year, so you are advised to arrive early to guarantee a good seat, and to wrap up warm. 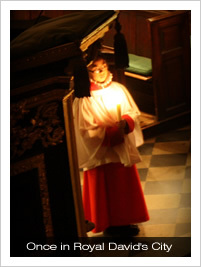 During the service, the Bambino is placed in our remarkable Crib (as featured in Simon Jenkins’ book “England’s Thousand Best Churches”), and all of your favourite carols are sung. There is no Homily. according to the Book of Common Prayer, with seasonal organ music and carols, and at 10:30am the Solemn Mass of the Nativity is sung by the Boys and Men to the ‘Missa brevis Sancti Ioannis de Deo’ by Haydn, with extracts from Handel’s Messiah and carols. This service is shorter than Midnight Mass, and includes a Homily aimed at the younger members of our congregation, this year focusing on the text of the Gradual Hymn “Christians awake, salute the happy morn”. 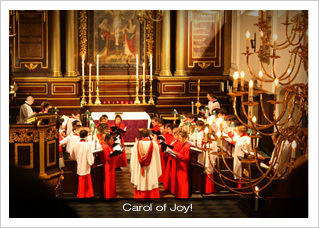 The Choirs are then on recess until the Feast of the Epiphany on 6 January 2012, when Masses are sung at 12:30pm (All Saints’ Singers) and 6:00pm (Choir of Boys and Men), and we remember those of our Orthodox brethren who are celebrating Christmas on this date. 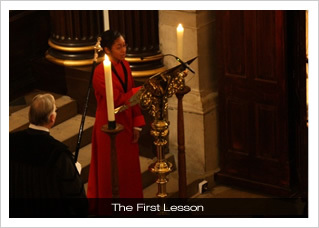 For full details of all our choral services, please see our Service List.